If you're familiar with the famous works of PBS documentary filmmaker Ken Burns - such as The Civil War, Jazz, and Baseball - then you have experienced what has come to be known as the "Ken Burns effect," even if you're not familiar with the term. The effect, in a nutshell, is the technique of panning across, slowly zooming in and out on, and fading between still photographs to create an ersatz movie effect. 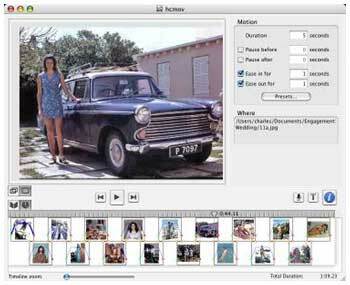 Photo to Movie is an application that allows you to to turn your digital photos into a brilliant QuickTime movie slideshows, complete with titles and soundtracks, and write them to DVD. The Ken Burns Effect doesn't really animate your still photos, but what it does his let you create an illusion of motion, which makes your slide show look at and feel more like video then an ordinary still photo slide show. Photo to Movie claims to give you more control over motion and higher quality movies than iMovie. You can have multiple segments of motion and even rotations. Photo to Movie uses a special algorithm to optimize each frame, which nearly eliminates flicker when played back on TV. The program incorporates a number of preset motions that can be customized to achieve specific defects, such as zooming in to highlight faces in a group shot. 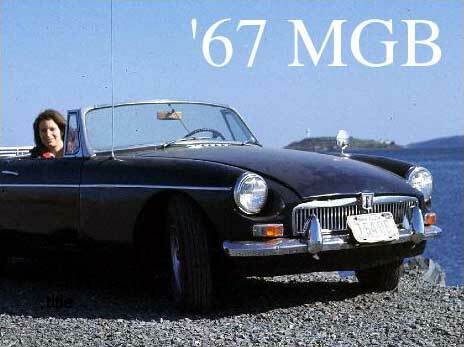 You can view a gallery of Photo to Movie movies at <http://lqgraphics.com/software/>. With Photo to Movie, you can create multiple "segments of motion", such as when you pause repeatedly to scrutinize each face in a group shot when looking at a photographic print. 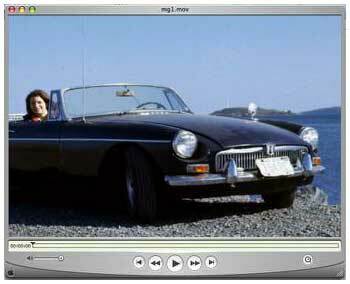 Photo to Movie lets you emulate this by pausing to hold the view anywhere in the range for as long as you choose to. You can also ease into and out of motion to make transitions even smoother, and photos can be rotated as well to add visual interest. 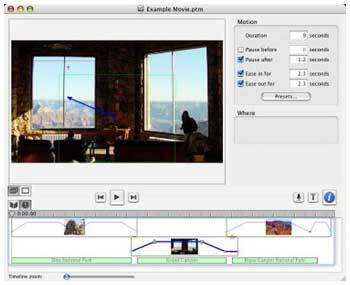 Photo to Movie allows you to set the motion of the duration along the entire motion path, not just the individual segments. More advanced effects are also supported in Photo to Movie, such as crossed motion paths, cross dissolves, wipes, and cute transfers. However, while Photo to Movie has a deep inventory of features, its basic functions are very easy to use and simple to learn. 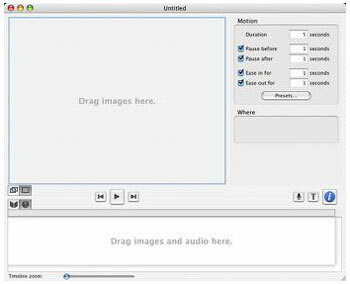 To create a basic movie slide show takes just a few minutes. 1. Drag a photo or a collection of photos to a new Photo to Movie document window. 2. 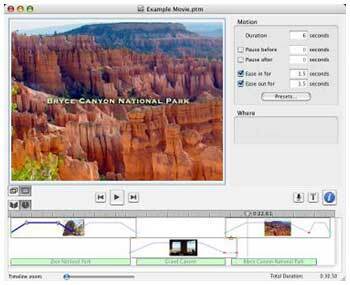 Edit specific motion effects and photo to photo transitions using the time line editor. To create simple zoom effects, just drag the key frames to define where the zoom will start and finish. The frames are helpfully color coded green for where the zoom begins and red for where it ends. A blue line pointing from the green frame to the red frame indicates the direction of motion when the movie is played. 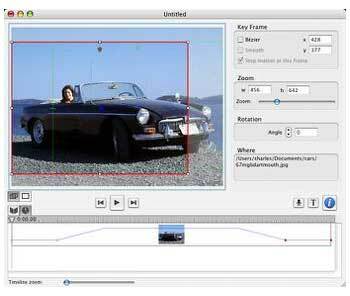 The multiple key frame view lets you see all of the key frames and the motion path on a single photo. You can edit the individual frames and the characteristics of the motion path by direct manipulation or by selecting the key frames or motion paths and editing their characteristics in the inspector. The single key frame view lets you see the portion of a photo framed by a single key frame. You can edit the position of the key frame by directly dragging the photo or by using the inspector. 3. Add titles and credits. Choose the typeface, size, style, and color (including transparency). If you're running OS X 10.3, you can add drop shadows as well. Position your titles by direct dragging, and fade them in and out for smooth display. 4. If you wish, you can add music and/or record voice narration. Drag your music from the Finder into the timeline and you have a soundtrack. You can adjust the timing of the music using the timeline and cross fade music pieces by overlapping them, and use the waveform to synchronize motion with specific sounds within your music. The "inspector" dialog shows you all of the information about the selected piece of audio. During export you have the choice of any audio format QuickTime supports. Record your own voice narration too. 6. Export your completed movie to a QuickTime file and store it on your hard drive for playback or burn it to a DVD or CD. That's pretty much it for the basics - all accomplished in a single, relatively intuitive and user friendly application window and various attendant dialog boxes. You can be up and running in a few minutes with the help of the clear and concise Quick Start Guide. Photo to Movie can do a lot more, but you're getting the idea. For more advanced effects, you can form complex, multisegment motion paths, zooming and rotating your photo along the way. Photo to Movie allows you to set the motion of the duration along the entire motion path, not just the individual segments. This confers a steady motion speed over the entire path. You can also choose to set motion durations on a segment by segment basis. The key frames define the motion path, the zoom, and the rotation. You can easily spin in your entire photo by setting the rotation angle to be greater than 360°. Photo to Movie is designed from scratch to work with digital still photos rather than as an add-on to full-motion video software. Both wide screen (16:9) and QuickTime VR are supported. This software is easy and fun to use. First developed as a Mac application (a Windows version is in beta), it exemplifies the elegant, intuitive quality that always has been characteristic of the best Mac software. At $49.95, Photo to Movie is inexpensive enough to appeal to consumer hobbyists but powerful enough to be a tool for skilled amateur photographers, photographic professionals, and computer graphic artists &emdash; anyone with the desire or need to present digital photos in more innovative, entertaining, and artistic ways than are possible using standard static slide show software. Photo to Movie doesn't even require an especially fast or powerful Mac &emdash; the minimum operating system supported is OS X 10.2, and the suggested minimum hardware is a 400 MHz G4 with 256 MB of RAM. It certainly runs well on my 550 MHz G4-upgraded Pismo PowerBook with no lags or hesitation noticed in the program functions, although saving movies to disk in QuickTime format was, well, less than "quick." That should be much less of an issue on any current Mac. I encountered no evident bugginess, but among the software's few shortcomings is that it doesn't properly support vertical compositions. Photo to Movie is a commercial application. The download is fully functional and can be used to try out the program's capabilities, but it places a watermark on each frame of the generated movie. To get rid of this watermark you must purchase a registration code.